An ultra-fine 1/2.5-inch CCD with an effective pixel count of 6.2 megapixels (maximum recordable pixel count of 8 megapixels) provides high-resolution image capture. A large 2.5-inch TFT liquid crystal monitor in a compact, light-weight, thin aluminum camera body provides vivid image display. An optical 3x zoom lens with a focal length ranging from 35 to 105mm (35mm film camera equivalent) perfectly frames your subject. A macro mode on the zoom lens lets the camera focus as close as 5cm / 2inch from a subject for close-up photography of small subjects. Adjustable white balance with settings compensates for a wide variety of lighting conditions: Auto, Daylight, Cloudy, Fluorescent, Tungsten, Sunset, and Custom. An exposure correction function (2EV, in steps of 0.5EV) shifts auto-exposure settings to compensate for tricky lighting situations. A continuous shooting function and auto-bracket function (-0.5EV, 0EV, +0.5EV) allow capturing quick bursts of images and automatic exposure variation. Adjustable ISO sensitivity (Auto, 100, 200, 400) sets CCD capture sensitivity for added exposure control. Special image effect settings (Black-White, Normal, Sepia, RGB) produce unique images, and sharpness settings (Soft, Normal, Vivid) control image clarity. Nine photo frame functions put graphic frames around your images. A motion picture function captures video of up to 640x480 pixel (VGA) resolution at a rate of 24 frames per second (24fps). Includes a built-in memory of 32MB and accepts SD / multimedia cards as well for additional image-storage memory. Is powered by a lithium-ion battery and includes a charger for the battery. Is compatible with PictBridge for image printing. An exclusive bayonet mount accepts a wide-angle conversion lens or a close-up lens designed for the DX-860G. 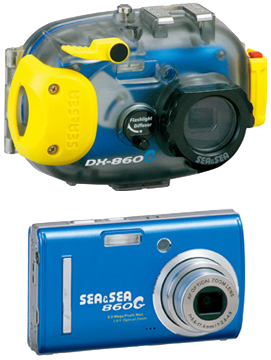 You can attach or detach each lens underwater. Comes with a single fiber-optic cable socket for an external flash. A built-in flash diffuser softens the built-in flash for more gently illuminated images. A lever-type shutter release makes tripping the shutter easy and responsive. The housing is rugged and rated to a depth of 45m / 150ft. Comes standard with an LCD monitor hood and inner camera hood to help keeping the camera’s LCD display clear and vivid in conditions with strong back lighting. Comes with an accessory shoe for attaching accessories.